Mike Pope holds up the envelope prepared for him by BWD employee Jennifer Tipton. She said it was an accident, that she’s made similar handwriting mistakes with at least one other name. Last week I gave you a rundown of what’s happening in the Belfair Water District. I’m on vacation this week, but I thought I’d share with you some of the continuing volleys since last Tuesday. Let me lay down the context first: This was a water district beset by turmoil between one commissioner, Mike Pope, and his two fellow commissioners and the district manager, Dave Tipton, before January. Now Pope’s antagonists on the board of commissioners are gone, replaced by residents more aligned with Pope. Tipton has leverage in the form of an employment contract that gets him two years’ severance if he quits for any reason other than getting another job and three if he is fired for anything other than a felony. Perhaps if you read this story you’ll have a general idea of where things were, then this one will tell you where they were as of Wednesday. The second story recounts how Jennifer Tipton, Dave’s daughter and BWD employee, gave Pope an envelope that had his name misspelled. It’s in the photo. On Thursday I received more emails. Tipton sent to District attorney Brian Snure one of the three reports that had been requested to be finished earlier in the week and said he hoped to have another one done later that day. Tipton also wrote me and said commissioners do have keys to the commission chambers, which I don’t think my story disputed. He also said commissioners have keys to bathrooms in the district shop outside the main building, so bathrooms are available at district meetings. There was an exchange between Tipton and Pope about the Humane Society’s request for a letter of support. Tipton recommended it. I haven’t seen the earlier correspondence so I don’t know how it was communicated, but Pope apparently saw it as a request for contribution and he suggested Tipton donate out of his own pocket. Tipton clarified the request, then Pope said put it on the agenda. Later on Thursday new commissioner Jill Satran-Loudin responded: “I have came to the office and had the dogs jump on the counter more than once, with there front legs,in fact the dog did that this morning when I came to drop off petty cash and also signed three checks that needed to be signed. commissioner, Jill Satran-Loudin”. In the only e-mail action I saw from Friday, Tipton responded to Satran-Loudin, “I do believe we only have one dog that jumps up on occasion, and that is the puppy, she likes to greet people. The others are older and not able to do so. Tipton is also asking the state auditor to look into the legality of paying Snure for time he spent with the district before he was formally hired. In particular he billed the district for the hours he spent traveling to Belfair and in the meeting before his official hiring and for work he did five days before he was hired. Some of my thoughts: I don’t believe there is a legal problem with the way Snure billed the district, but if there is it is probably good that Tipton attempted to find out, whatever his motives might have been. On the dogs, it is not uncommon to meet the dogs at district offices during daylight hours. In fact, for me it’s one of the highlights. I can’t have a dog, for now, because we’re moving and the house we’re in really isn’t suitable. But I grew up with dogs, and the ones at the district are first-rate, friendly, family dogs. They’re also bigger, so I think they probably can put their front feet on the counter. Knowing their personalities they probably would, just to see who the visitors are and whether they can get a scratch behind the ear. I can see why someone would want them there as well as why someone wouldn’t. For months we have been covering the unlikely events that have been happening with the Belfair Water District. I say, “unlikely,” because what I had experienced mostly over the phone was unlike any other government I have ever covered. I remember a city councilman chastising residents over their characterization of him. I remember a city worker publicly accusing a city councilman of trying to get him fired. I saw the hysterics at the health care town halls. I had a conversation with a city councilman once when he told me how much he hated (his words) another member of the council. Yet never had I experienced the kind of dysfunction I was hearing about over the phone and in court documents like the stuff I was hearing from the tiny little water district on the Hood Canal. I was probably about 5 minutes late to the meeting. I admit it was because I had never been there and quite frankly I thought it was somewhere else along Highway 3. Fortunately for me Mike Pope, the commissioner who for now is on the outs with the other two commissioners and with the utility’s manager, was arriving just as I was. I would have missed some early fireworks had he been there on time. The commissioners then addressed an agreement Tipton negotiated with the Mary E. Theler Community Center & Wetlands in Belfair. 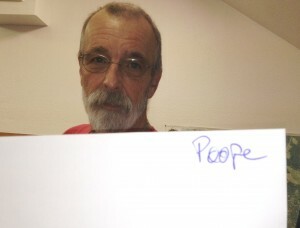 Phillips was unhappy with the terms. I’m not sure if it was over the amount or that the center wouldn’t be paying it all right away. “If they’re solvent, pay their bill.” Pope said something I didn’t catch, something Tipton said was not true. Phillips continued to protest the agreement. “We had every right to turn off the water. Isn’t it kind of stupid hiring a lawyer a for a stupid little water bill,” Phillips said. Tipton said it was the best solution for both parties, because it settles it. It was approved 3-0, which I think may have been the only unanimous vote of the meeting. A resident who received an inordinately high water bill (by more than $1,000) one month appealed her bill. The board denied her. Harry Hatlem, a commissioner, told her “The water went through the meter.” The meter was tested after she questioned the bill and the district found it was working properly. She found no leaks. Phillips said the board asked for volunteers to work on the district’s budget, but no one called. Pope said that was because the number advertised went to a fax line. There was a lengthy discussion about a property that had not been billed for a year because of a fire. The property was to begin getting billed again. There was a short argument. Phillips asked Pope if he wanted to work on something. (I’m sorry. I don’t have the details of what it was.) Pope declined. Phillips said Pope hadn’t done anything in three years on the board. “You don’t want to do it?” Phillips said. “Not as long as you’re on the board, John,” Pope responded. Public comment begins. It is worth noting that the rules for public comment are on a sheet of paper attached to two walls. People are required to sign in, name a topic, and they are limited to two minutes. Public comment ends after 15 minutes. Greg Overstreet, attorney for three different parties who sued the district on public records issues and won a combined $82,000 on it, addressed the board. He made the case, and provided written documentation breaking it out, that the clients made no money on the suit. They were reimbursed small sums for their expenses, but almost all the $82,000 went to Overstreet’s firm. Now, I don’t remember seeing outright claims of enrichment of the plaintiffs in this case, though I have seen implications. This is a touchy point for them and for their attorney. Overstreet said to the board that he provided the documents to show how the money was disbursed. “If you were to tell people that my clients made money, you would be sued for defamation,” Overstreet said. Phillips said there is a perception the clients made money. They discussed a little how that perception happened. At one point Tipton said “His two minutes are up.” When Overstreet was finished Pope took issue with Tipton, who Pope said had muttered, “Rot in Hell” toward Overstreet. Tipton said “I didn’t it say to him.” Overstreet asked Tipton if he would say it loud and to his face. Tipton declined. Overstreet called Tipton a “coward.” Phillips said that was slander. “You are a lawyer. You should know better.” Overstreet said Tipton is a “public figure,” citing Supreme Court decisions. They went to executive session, during which time I chatted with some from the audience. Bonnie Pope, who said she lived her whole life in the area, said she has had longtime friends asking her if she made money on the lawsuit, friends who admitted they thought she had. That is a sore sport for her and the other litigants, because they have all said they do not relish costing their friends and neighbors money, but the district did not comply. Mike Pope stormed out of the executive session saying, “They’re attacking me in there and they refuse to make it public.” The board returned to the dais and Pope asked that his personnel issue be held in public. The other board members said the issue wasn’t about him. Phillips declared the meeting over. “I was physically restrained from leaving that door,” Pope said of the executive session. “Mr. Pope’s a liar” Tipton said. There was another testy exchange between Phillips and Overstreet in which Phillips asked if Overstreet was going to bill his clients for attending Tuesday’s meeting. This was when someone suggested turning off the tape recorder used for the meeting. I spoke with Phillips and Tipton and Hatlem for a bit after the meeting. Phillips said we hadn’t been kind to the district. He was suggesting, I think, that we were hard on the district because Overstreet represented us before. He made reference to David Nelson, our editor, having his face on Overstreet’s website as a client. (It may have been there before. It isn’t now. Nor is the Kitsap Sun listed as one of the Allied Law Firm’s clients.) He also thought we were writing stories because Nelson demanded it. I informed him otherwise. Tipton showed me a map and outlined what the pressure issue was. He clearly relished explaining that issue and said as much, professing a disdain for the political stuff. He also said the issue inside the executive session was not about Mike Pope. He and Phillips also said the move away from Kitsap Bank was because the bank was slow to release the district’s money after the district had paid off its penalty to the public records litigants. 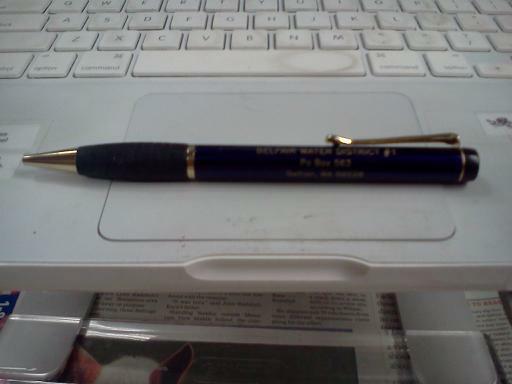 Phillips gave me a water district pen (pictured above). I turned it down at first, then accepted it. I left the district offices into the rain and headed back. It’s probably best I leave it at that.